One thing that Android platform seriously lacks in comparison to iPhone (iOS) is quality gaming. Even though it fully supports good graphics and game play, but the developers for whatever reasons so far have not been able to deliver the quality of games that Apple’s iOS devices deliver. But now it seems like all that is going to change. Engadget has the latest scoop from one of their reliable sources who claims that Sony Ericsson is working on a gaming phone which will look a hell a lot like the PSP and that it will be powered by Android 3.0 Gingerbread, bringing PlayStation titles to the platform. It seems that Sony Ericsson — a company that has yet to even introduce an Android 2.0 device — is at work on a project to redefine gaming on Google’s mobile platform. We now know (via a trusted source) that the company is actively and heavily developing a brand new gaming platform, ecosystem, and device (possibly alongside Google) which are already in the late stages of planning. And we’ve got the goods on it. 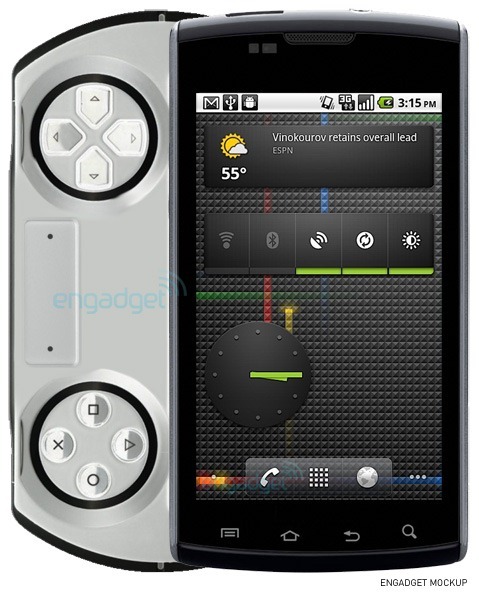 This flagship product of Sony Ericsson will feature: 1GHz Snapdragon processor, a large high resolution display (rumored to be around 3.7 inches to 4.1 inches), and instead of QWERTY keyboard, it will have PSP like controls for gaming, something which is currently being dubbed as “long touch pad” for analog controls. The form factor will be on the lines of Xperia X10 and of course it will be powered by Android 3.0 Gingerbread. Games will be available for download via a dedicated market, which will initially be exclusive to this device only. But there is no reason why it wont be available to other phones that meets the hardware requirements of this so called “PlayStation phone” series. Graphics quality is said to be as good as the ones seen on PlayStation and the PSP – now that’s big if you ask me! It is slated for October 2010 release. Woah! Now that’s something that might make me look at my iPhone to step it up!..maybe not though since I’m already playing psx games smoothly on my 3GS! i support the idea that the so called device would support android but it won’t meet with iphone ios games anytime soon… What android needs is a “phone” device that support gaming in a good matter nit the other way around! yeah… but it want psp3d phone… a step ahead instead of catching up with apple’s tail. I think… I think I’m in love. No way, Sony would develop their own OS, probably based around the XMB that’s on the PS3/PSP among other devices. A Dream come ture for me….